1917-18: Football letters are issued to 19 team members, three of whom – Ed Shaw, Farley Young and William Day – are getting set to enter the military. 1932-33: Former Husker star John Choppy Rhodes resigns after three seasons as head coach at Wyoming. «1937-38: Elmer Dohrmann reels in seven pass receptions as the East and West all-star teams battle to a 0-0 tie in San Francisco. The performance has pro teams vying for his services. 1962-63: Bill Thunder Thornton scores two TDs in the Southwest Challenge Bowl all-star game. Meanwhile, three weeks after the Gotham Bowl, Nebraska and Miami continue waiting for their checks. 1967-68: Wayne Meylan shares MVP honors as North beats the South, 22-16, in the annual Blue-Gray game. «1972-73: The Huskers send Bob Devaney out in style with a 40-6 Orange Bowl win over Notre Dame. 1982-83: NU beats LSU 21-20 in the Orange Bowl. 1987-88: Florida State rallies for a 31-28 win over the Huskers in the Fiesta Bowl. 1992-93: The Huskers bow to Florida State, 27-14, in the Orange Bowl. Bob Devaney again expresses unhappiness about his exit as athletic director. «1997-98: Nebraska earns a share of the national championship with a 42-17 win over No. 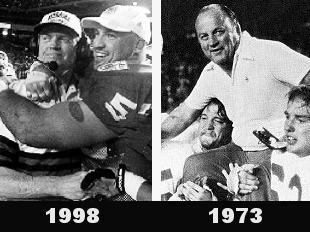 3 Tennessee in Tom Osborne's final game as coach. 2002-03: Searching for an offensive coordinator, Frank Solich talks with Kansas State's Greg Peterson. 2007-08: Tim Beck emerges as the final piece of Bo Pelini's first coaching staff. 2012-13: Georgia uses big plays and a big fourth quarter to defeat the Huskers in the Capital One Bowl, 45-31. Also, former Nebraska coach Pete Elliott dies at age 86.